Three million quid here, £9.3bn on the Olympics there, sixty grand per unspecified number of illegal immigrants, Vodafone dodging nine bajillion pence in tax, gold-plated pensions, gold-plated ministerial toilets…confused? It figures. Many of the big numbers we’re bombarded by in the media are paid for by ‘the taxpayer’, whoever she is. But taxation is just the collection of money from a large number of people. For example, if everyone in the UK gave me 1p, I’d have £600,000. Actually, could we arrange that? The sensible way to look at money is in quantities we can all understand: pounds per person per year. 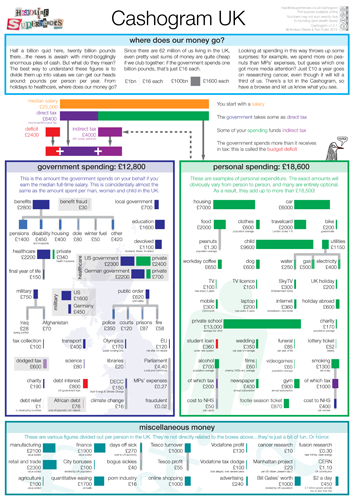 Whether it’s running your car, feeding your dog, or invading a Middle Eastern country on a whim, the way we should budget is as individuals, because that’s the scale at which the figures make sense. The Cashogram is our attempt to digest the countless billions blown on medicine and the military in terms of everyday items, like groceries, holidays and computers. So, if you haven’t already, check it out in PDF or image form. If you’ve got some burning questions you need answering right now, have a look at the FAQ. Are benefits well fair, or are pensions a state? It’s initially surprising (except to Express readers) that the single largest bit of government spending is benefits: a stonking £2800. However, it’s subsequently surprising that half of that goes on a benefit we’d all hope to receive one day—pensions. The fraction spent helping out jobseekers is pretty tiny, especially when you consider how much unemployment there is these days. And while the £30 of defrauded benefits is slightly galling, you probably spend more than that on a month’s dairy products. What?! I like yogurt. The most astonishingly expensive benefit is winter fuel, but presumably the quantity of political capital procured with just £50 is worth every penny. Dodged tax is twenty times more significant than benefit fraud (standing at £600 and £30, respectively). But even if we rugby-tackled all the tax dodgers and benefit scroungers in the land, we still wouldn’t even pay for a quarter of the annual deficit (which is the amount the government overspends compared to the tax it receives: £2,400 each!). The only simple thing about government finances, it seems, is finding a scapegoat. Stop the press: houses and cars cost a fortune! 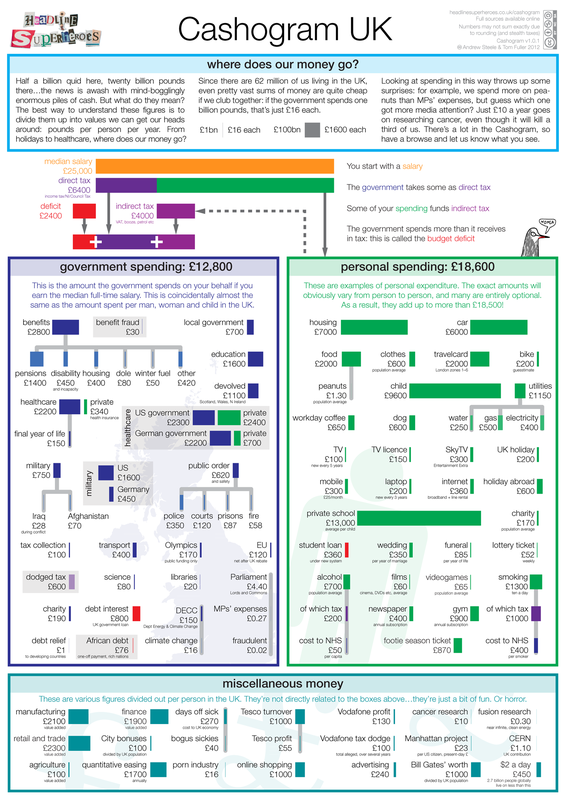 Not exactly front-page news, but it’s pretty surprising when you compare our ready-reckoned cumulative cost of £13,000 to just about anything else in either personal or governmental expenditure. For example, £2000 per person per year for healthcare sounds expensive, until you realise that owning and running the average car is three times pricier. Do we really value driving our bodies around three times more than keeping them healthy enough to bother? Puffing on cigarettes, assuming you don’t import every last smoke duty-free, more than pays for your eventual cost to the NHS. So tobacco tax would appear, depending on the scale of your cynicism, to be somewhere between state nannying and governmental money-spinning. Science is phenomenally cheap. The entire government spend on it is £80. We spend just £10 per person per year on cancer research, even though it’s a disease which will kill around a third of us. And cancer is relatively well-funded—the fact that even this looks so paltry is a stark illustration of just how little we invest in our collective future. The Manhattan Project cost each and every American just £20 per person per year. Science really is bargainacious: saved from nuclear oblivion at the hands of Johnny Hitler for less than the price of the DVD box set of The World At War . Cheap though science is, we can’t seem to scrape together more than 30p per year for fusion research—a technology whose successful development would give us near-infinite, clean energy. Obviously it’s not guaranteed to work (cynics would chuckle that it’s been thirty years away for the last thirty years. Ha ha, oh, you cynics, what are you like? ), but I’d lob a quid in a bucket on the off-chance, wouldn’t you? The military costs us £750: about the same as an annual foreign holiday for everyone. So, if we halved military spending, we could all invade a foreign country en masse with buckets and spades instead of Tornadoes and assault rifles, every two years. If there’s one thing guaranteed to give the nation an itching for mindless conquest, it’s taking away their morning coffee. For the price of a hot beverage every workday, we could double military spending and take out Andorra. The cost of the wars in Iraq and Afghanistan is quite shockingly low. Iraq set us back just £25 a year when it was still going, and Afghanistan is currently costing £70. Admittedly we could, say, double the science budget by bringing Our Boys home from Central Asia, but this money pales into insignificance next to things like benefits, education, the military budget…hang on. Are the costs quoted for badly-planned invasions just for the expense of deploying fleets of aircraft carriers and battalions of ground units, on which a rather more substantial sum has already been spent? The opacity of military book-keeping means we’re not sure. All alone or all a loan? The hated Tory student loan plans are only as crippling as the average wedding, when the cost of the average wedding is spread over the average length of a marriage (27 years, if you were wondering). Both come in at around £350 a year. The difference is that having a degree makes you more employable, whereas thankfully we’re no longer in the era where being married does. And speaking of loans, the world’s billion or so richest could pay off African debt for a one-time payment of just £75 each. That doesn’t mean that that’s either politically possible, nor actually desirable—the developmental challenges of the continent are more numerous than its nations, and handing over huge quantities of cash to repay dodgy lenders or fund psychotic militias might not make things better—but it is an indication of the small sums of money with which we could transform the developing world. Beleaguered libraries, poster-child of callous ConDem cuts, cost us a whopping £20 each annually. That’s enough to buy everyone an e-reader at full retail price over five years. Or we could just buy a couple of paperbacks a year. Another possible denominator for this figure would be number of books borrowed: it comes in at around £4 per book. Obviously libraries are more than boxes of books, but given their price it does seem worth thinking outside the box. Or just closing them all down without thinking; why not? It’s hard to draw a single, smackdown conclusion from what’s basically an executive summary of the entire economy, but we hope some of the above has tickled your preconceptions and prejudices: it certainly did ours. What probably surprised us most is science: that you’re reading this on a computer connected to the Internet when we’ve only been spending such tiny sums on research is properly incredible. What technologies could emerge, or diseases could be cured with just a bit more human effort is obviously impossible to predict—but it definitely seems worth spending a few more quid to find out. If after all that lot you still have a few questions, why not try the FAQ? I like the left-hand side. I was looking for something like that. I probably would try and squeeze out some extra money for science. Interesting to figure out where I’d take it from though. I’m not so keen on the right-hand side. Lots of the costs aren’t applicable to the median earner on the left, so it doesn’t really seem to help with context. Which costs do you not think are applicable to the median earner? The really obvious one is private school, but otherwise it’s all fairly typical, isn’t it? I guess if you include the housing, car, food, clothes, utilities, alcohol, mobile, tv licence and holiday you’ve used up your £18k. Kids and coffee are out of the question. I’m a more or less median earner. I live in Oxford (expensive) and I pay £5000 rent. My car costs ~£3500 a year (your value is for a brand new car, including £3000 depreciation). My Oxford United season ticket would cost £250, if I had one. I felt quite extravagant paying more than £500 for a bike, but that was more than 5 years ago. So that sort of thing. But the great thing about the tax part is you don’t have to ask the question. The point of the spending side isn’t to provide some prescription of where exactly people’s money goes—apart from anything else, as you demonstrate, that varies a lot between individuals—but to provide context for the figures on the left. The other factor is that people often come in pairs, so the cost can be spread somewhat (they may not own two cars, etc). Or, conversely, another conclusion from the Cashogram might be that being a single parent looks pretty tough…which is probably true. That said, it is pretty hard to come up with meaningful numbers, but here are some attempted justifications for the figures anyway! On the rent, our figure is 75% of our ‘representative’ total rent/mortgage cost, because it doesn’t seem unreasonable that one member of the household might earn more than the other and pay more for rent. And, if you do live on your own, it’s a bit pricier. So, assuming your rent there is split evenly between two, we should multiply it by 1.5, giving £7500, which is pretty close to our £7000—but perhaps we should’ve been more transparent about that! You’re absolutely right about the car. A re-read of that article suggests that the average used car costs £4441 a year to run, which does sound a bit more plausible. It would be good to know the average age of a car driven by a median earner, or even better a figure for the range of spends by median earners, but in the absence of that these figures do seem sensible for calibrating the order-of-magnitude-ometer. The bike is certainly on the pricey side, but we guessed the figures based on it being a commuting bike so it could be fairly compared with the car and travelcard, ie a fairly nice bike which needs frequent maintenance and will get stolen relatively often! We certainly aren’t suggesting everyone has a season ticket, or which club they’d get one for, just quoting the price for a Premier League one, for fun. If you’ve got any better suggestions for the personal spending side, we’d love to hear them—but the point is still that it’s a calibration tool more than anything else. Sorry, I didn’t want to get petty about the details. I think the implication from the diagram is that you can’t afford a child on the median wage, though, isn’t it? There must be something that’s not quite right. But I agree it’s very difficult to get meaningful numbers here, and maybe it does help with context. That’s OK, the details are where the devil is. Or something. Anyway, it’s important to get these things right! and you’ve got nearly £13,000 ‘spare’ to cover a child (who’ll supposedly cost £9600). This is obviously pretty rough and ready, but it looks like the numbers could superficially add up. When it comes to the costs of higher education, fees are, technically, not supposed to be paid for by parents but as a graduate loan once the youngster is on the career ladder. This is a middle class view of life, assuming that parents all buy their offspring their first car.